You should look for an unexpectedly large number of proton-proton collisions that show signs of both (a) quarks, anti-quarks or gluons (particles that are found inside protons and other hadrons) flying out of the collision with very high energy, as though shot from a gun (and creating sprays of particles, called “jets”), and (b) undetectable particles flying off invisibly, carrying off lots of momentum and energy. The purpose of this article is to explain to you why people give this answer, and what its strengths and weaknesses are. the superpartner is more massive than the particle we already know about. In the most popular forms of supersymmetry, the superpartner of each particle we know is just heavy enough to be out of reach of previous experiments but within reach of the Large Hadron Collider. Fig. 1: The particles we know about, along with the Higgs particles and the superpartner particles (sleptons, sneutrinos, squarks, gluinos, charginos and neutralinos) predicted by Supersymmetry. The heavier particles are at the top. The reason many physicists believe it likely that the superpartners will lie in range of the Large Hadron Collider is that they believe that supersymmetry can serve as the solution to a puzzle known as the hierarchy problem. If the superpartners are much heavier, then the solution to the hierarchy problem must lie elsewhere. Where does the answer “Jets And Missing Energy” come from? Well, let me first tell you what these physicists have in their minds, and then I’ll tell you how it got there. Since the proton is made from quarks, anti-quarks and gluons, which are affected by the strong nuclear force, the easiest superpartners to produce in the proton-proton collisions at the LHC are their superpartners: squarks, anti-squarks and gluinos. 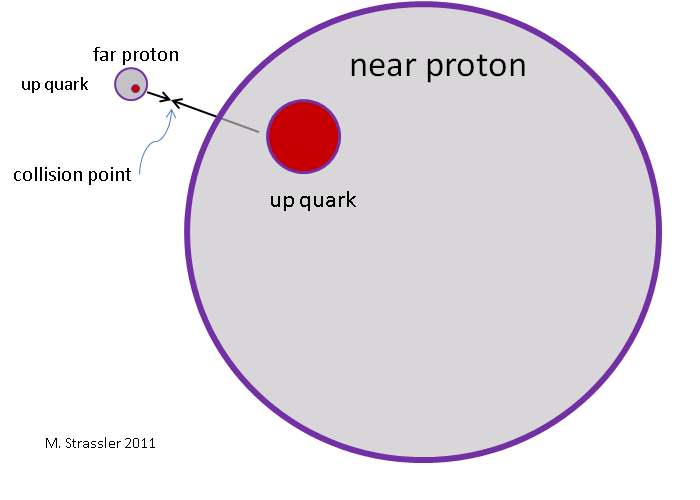 For example (see Figures 2 and 3), in a proton-proton collision, two up-quarks might collide and form two up-squarks. Fig. 3: The colliding up quarks from Figure 2 produce a pair of up squarks, each of which almost instantly decays to an up quark and a neutralino (a mix of the partners of the photon, Z, and Higgs particles). What would happen next? Like most particles, squarks would decay. Decay to what? 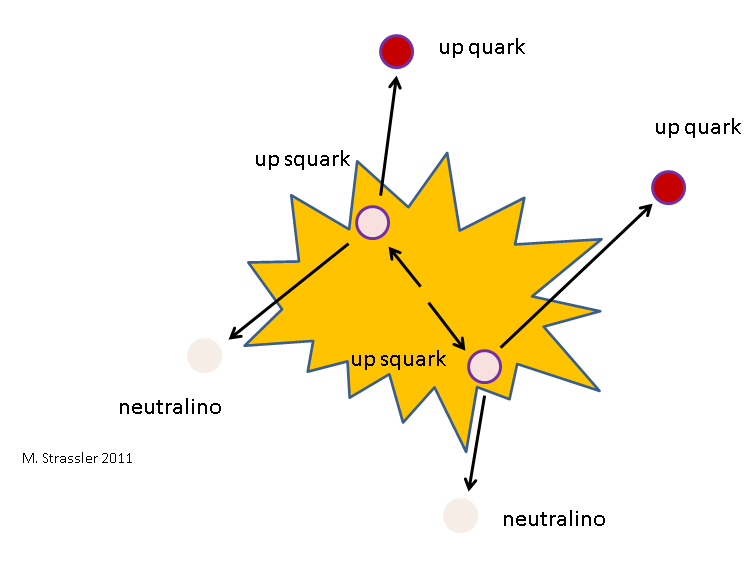 In many variants of supersymmetry, squarks decay to a quark, plus another superpartner, called a neutralino (a mixture of the superpartners of the photon, Z, and Higgs particles.) The quarks carry a lot of energy and turn into jets, while the neutralinos zip through the detectors without leaving any observable signal. What we will see, therefore, is two high-energy jets, one from each of the two quarks, and signs that they are recoiling against something invisible and undetected. Fig. 4: Each high-energy quark from Figure 3 is transformed into a jet of hadrons (particles containing quarks, gluons and antiquarks) while the neutralinos rush unchanged out from the collision point. The collision itself, with production and decay of the squarks, is shown in Fig. 3. The jets and neutralinos that rush out from the collision point are shown in Fig. 4. And what the detector actually detects — the only information that scientists get in their data — is Fig. 5. Fig. 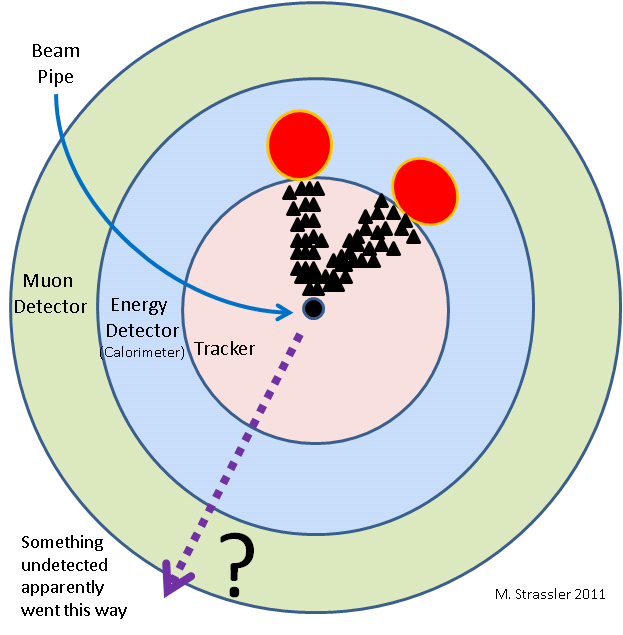 5: An LHC detector (ATLAS or CMS) will detect the two jets from Figure 4 as localized electronic signals generated as the particles traverse the tracker and stop dead in the energy-detector. The two neutralinos leave no trace, and their presence can only be inferred from the absence of anything recoiling against the jets. If instead it is gluinos that are produced in pairs, the situation is only slightly different. 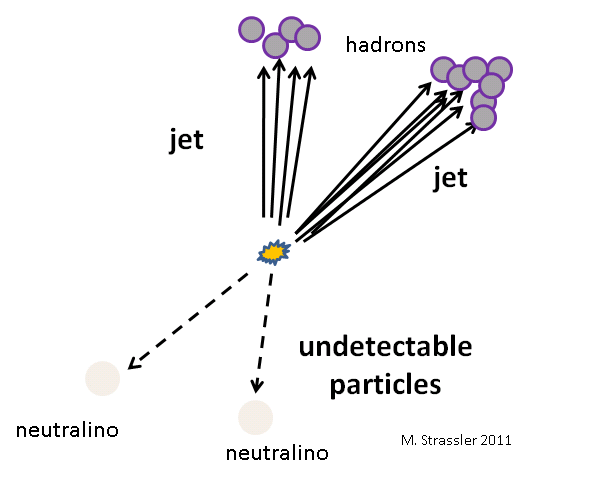 Typically each of the two gluinos decays to a quark, an anti-quark and a neutralino, so it is again true that the detectors will see jets (four, in this case) along with lots of missing “energy” from the two neutralinos. That’s the vision passing through the heads of these physicists when they answer your question about how to find supersymmetry. To comprehend where it comes from requires us to explore the underlying assumptions that go into it. And that’s the logical journey we’re going to undertake next — illustrated in Figure 6 down below. At the end of our tour, you’ll be able to judge for yourself, to a degree, the strengths and weaknesses of this answer to your original question. The logic involves three main assumptions. Why do theorists impose this criterion? Without Assumption 1 supersymmetry would predict new forces among matter particles, and typically they would make protons quickly decay. That would be in conflict with data. The proton is very stable (thankfully — even a rather slow rate of proton decay would kill us, and melt the earth, and so on…) You can take a vat full of a billion trillion trillion protons and wait for ten years, and you will not see a single proton decay. (Yes, people tried this! You need 180,000 tons of water.) So without Assumption 1, supersymmetry (and we) would be dead on arrival. But if Assumption 1 is true — if R-parity is conserved — those new forces are forbidden. Supersymmetry plus R-parity conservation predicts a very, very long-lived proton, consistent (in favorable circumstances) with data. Note that this requirement of the conservation of R-parity is not imposed because supersymmetry requires it, or on the basis of some theoretical principle. It is added because consistency with data requires it. That said, it is a perfectly reasonable requirement from the theoretical point of view. 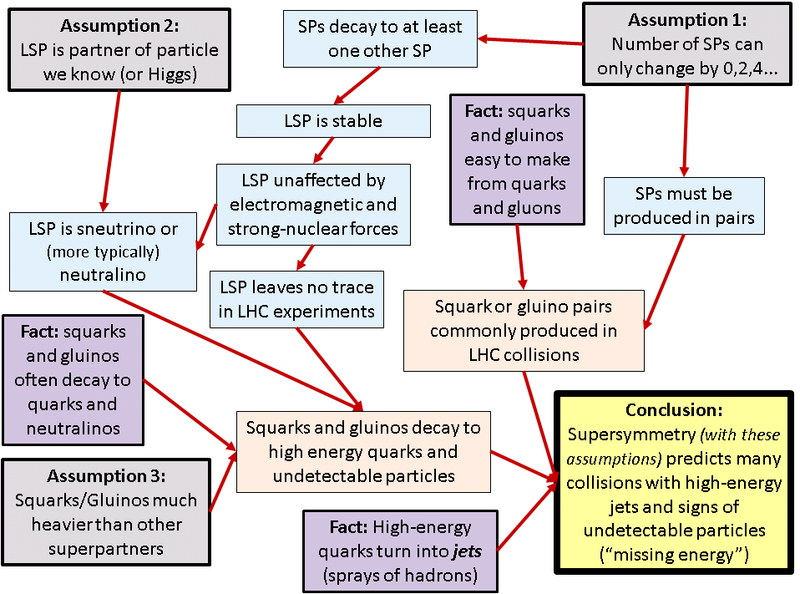 Assumption 2: of all the superparticles in nature, the lightest one is a partner of a particle we’ve discovered already, or of a Higgs particle, and therefore it is one of the superpartners appearing in Figure 1, at the top of this webpage: a gluino, squark, charged slepton, sneutrino, chargino or neutralino. One could certainly question this assumption. For one thing, if supersymmetry is true, then the graviton (the force carrier of gravity) has a superpartner too, called the gravitino — and I didn’t put that in Figure 1. How heavy is the gravitino? We don’t know. In some variants of supersymmetry it is about as heavy as the heaviest superpartners shown in Fig. 1, the squarks and gluinos. In other variants it is quite a bit lighter, and could even be lighter than an electron! That would violate Assumption 2. Or there might be particles in nature that have rather small masses and that we don’t know about yet because they are very difficult to produce or detect — particles that are not affected by any of the three forces shown in Figure 1, the electromagnetic force or the weak and strong nuclear forces. Such particles are typically called “hidden”, because of how hard they are to produce even if they are very lightweight. (If there are several types of hidden particles, they are often collectively called a “hidden sector”.) Now, these particles have superpartners too, if supersymmetry is true — as mentioned in this article on supersymmetry, supersymmetry is really a symmetry of space and time, so any type of particle that travels in space and time must have superpartners. And if any of these superpartners are lighter than the lightest superpartner shown in Figure 1, well, then Assumption 2 is wrong. Assumption 2 is not required by any experimental data. The best theoretical arguments against hidden particles suggest that nature is most likely to be simple and elegant, and since hidden particles are extra baggage, they are unlikely. (Whether you are convinced by this argument is a matter of taste.) And the best argument against a light gravitino is that stable gravitinos can cause various problems during the Big Bang. There’s another argument in favor of Assumption 2, having to do with the lightest superpartner being able to serve as the dark matter of the universe, but to understand it we’ll need to understand a few of the various consequences, so let’s hold off on that for the moment. Assumption 3: the superpartners that feel the strong-nuclear force — squarks, anti-squarks, and gluinos — are on the heavy side, quite a bit heavier than the other superpartners, though not so heavy that they aren’t produced often at the LHC. This is a squishier assumption than the last two — what exactly do heavy and often mean? Rather than discuss that here, let me simply say that in many, many variants of supersymmetry this turns out to be true. Theoretical calculations do show that in many different scenarios, those superpartners affected by the strong nuclear force end up heavier than most of those that aren’t. But again, it is not always the case. Fig. 6: The logical chain that leads particle physicists to look for supersymmetry by searching for collisions which look something like Fig. 5. SP stands for "superpartner''; LSP for "lightest superpartner". See text for more details. Now what follows from these assumptions? There are a number of very important consequences that are important to recognize; you can use Figure 6 to keep track. If you start with no superpartners (as you do when two protons collide), and you produce superpartners in the collision, you must produce at least two of them. You can’t start with zero superpartners and end up with one. If you have a superpartner sitting around and it decays, there must be at least one superpartner (possibly three or five, but it turns out almost always just one) among the particles produced in the decay. You can’t start with one superpartner and end up with zero. The lightest superpartner cannot decay — it is a stable particle — because particles can only decay to particles that are lighter than they are, and for the lightest superpartner to decay would mean one superpartner would turn into zero superpartners. Remarkable! supersymmetry plus R-parity conservation implies an as-yet-undiscovered stable particle — the lightest superpartner (often written LSP). What properties could this particle have? Suppose this type of particle were affected by the electromagnetic force or by the strong nuclear force. Then (i) many such particles would have been created in the early universe during the Big Bang; (ii) they would have altered the abundance of various elements, such as lithium, during the Big Bang, so that these abundances would be in conflict with what we observe today, and (iii) they would still be floating around the universe, with a few of them hitting the earth, creating exotic atoms that would long ago have been detected in careful searches for new and unusual atoms. Though this merits a longer discussion, the basic conclusion is that any new stable particle must be insensitive to the electromagnetic force and the strong nuclear force. And finally, Assumption 3 is that it is easy to produce squarks and gluinos, and they are relatively heavy. That means that they blow up with a relatively large amount of energy; when they break apart, the energy and momentum carried by the quarks and neutralinos to which they decay is big. The resulting jets will carry high energy, and the missing energy will be large. So now I hope you can understand the vision encapsulated in Figures 3, 4 and 5. 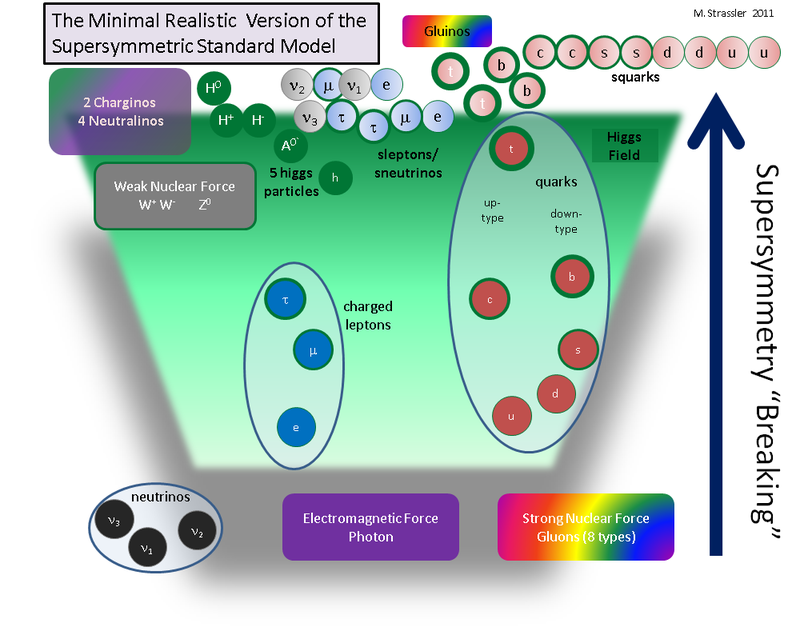 If supersymmetry is right, the logic goes, we will produce heavy squarks and gluinos; they decay to high-energy quarks and neutralinos; the quarks show up as high-energy jets, which are easily detected, and the presence of the neutralinos, though undetected, is inferred from an imbalance in the momentum of the jets. So ok, we look, and we either find or we don’t find. Then what? And therefore, if we see an excess number of collision events with high-energy jets and missing energy, that’s great; maybe we’ve discovered supersymmetry. However, CAUTION-CAUTION-CAUTION-CAUTION: other types of new phenomena can create similar looking events — it will be some time, years probably, and a lot of hard work, before we would start to be confident as to whether we were looking at supersymmetry or something else new that just looks similar to supersymmetry at first glance. Just because you see something like Figure 5 doesn’t mean that it was produced by Figure 3! or supersymmetry is a property of nature but something is wrong with one of the three assumptions in Figure 6. Don’t be surprised to see press articles and statements by some physicists that go a bit too far interpreting the results from the LHC. It takes time to build knowledge, and impatience often leads to mistakes. Personally I think we need to state our assumptions, and check them whenever possible, when making claims about the existence of supersymmetry, or any other essential properties of the universe. even without jets and/or missing energy, a pair of charged leptons or a pair of charged anti-leptons (that is, two particles with the same electric charge), or perhaps even three or four charged leptons and anti-leptons. The processes in the last set are so rare and remarkable that there are few other processes in nature that can imitate them, which is why, in trying to distinguish them from look-alike backgrounds, it may not even be necessary that there be high-energy jets and/or missing energy in the same collisions. For this reason they are less sensitive to the three assumptions in Figure 6. I’ll be keeping a close eye on searches for those processes. Matt, I find myself checking your site every day to see what you have for us. Great articles pitched at just the right level for me. I have a science degree from 15 years ago and avidly follow developments in newscientist etc, but your site is giving me that next level of understanding. Thanks a lot. Thank you for the kind words — you give me confidence that I’m doing something right. I’ve come across the term “cold QCD” and looked up some of the papers. I’m lost. I hope that you will do an explanations article. I’ve recommended your blogs to other amateurs. Here is one with a small extract. I’ll keep watching your blog. A quantitative understanding of quark energy loss is essential to make deﬁnitive statements about the observations of jet quenching in relativistic heavy-ion collisions; there are numerous additional complications for a hot plasma that are not present for cold nuclei, such as thermal gluon absorption by propagating partons, and a highly non-equilibrated environment. Fluctuations in the number of radiated gluons have been suggested to be very important for understanding the radiated energy loss of the highest energy jets, based on the ﬁrst data from RHIC. It has also been suggested that the cone of outgoing particles associated with a struck quark is much broader for hot, dense nuclear matter than for cold. Yes, it will be quite a while before I turn to this topic. I still have a huge amount to do to make the site fully usable for laypersons. The focus of this site for most of the rest of the year will definitely be the search for new phenomena in LHC proton-proton collisions. To explain the physics of heavy-ion collisions and dense QCD would be a whole project in and of itself, requiring many articles…. and for a paper such as you just quoted, some study, as I have not been following this particular issue closely. But I’ll try to remember to mention it if I learn something about it at a conference. how would this impact the string theory? Exactly how did you be capable of develop this type of excellent crowd of commenters to your web page? on the planet “Pandora” that will see you travel throughout the planet shooting and destroying many different types of enemies and looting their bodies for different items. you a bundle of dynamite to use to kill an enemy and allowing you to move at full speed. with a few shortcomings. A sniper rifle is an obvious choice because it is the kind of weapon you fire and then try to move to a new cover spot with. Adventure Couple of, producing haphazard very cold and also lagging. Sirens, kill a mob with your action skill and you’ll get “Truly Outrageous”. investigate if 2K Video games and Gearbox Software can intensify to the plate using their latest iteration. Hi, Matt. I’m actually writing a screenplay involving the LHC (and a “B-story” involving a fatal car crash, lost love, and saving the universe). I’m not a physicist, but am relatively good at math, went through Leonard Susskind’s numerous YouTube lectures, and read a lot on the subject. I stumbled into your excellent website through a web search that now escapes me, but THANK YOU for your discussion and descriptions. The concepts of how things combine are accessible through some matrix algebra, but I always feel like the math leaves me walking backward. I don’t feel like particles decay so much as contribute energy back to one of the four forces. Because the bubble chambers only record what they’re set to record (at our current level of technology), I wonder if some of the energy is disappearing backward from the initiation of the trails (yes… backward in time) or being exchanged with another universe. I think we’ve captured symmetric particles in other experiments, but I can help but feel there’s something missing here besides a neutral meson.